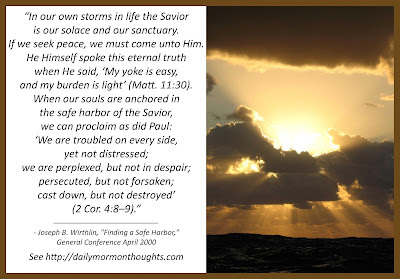 "In our own storms in life the Savior is our solace and our sanctuary. If we seek peace, we must come unto Him. He Himself spoke this eternal truth when He said, 'My yoke is easy, and my burden is light' (Matt. 11:30). When our souls are anchored in the safe harbor of the Savior, we can proclaim as did Paul: 'We are troubled on every side, yet not distressed; we are perplexed, but not in despair; persecuted, but not forsaken; cast down, but not destroyed' (2 Cor. 4:8–9)." This is one of my favorite talks by Elder Wirthlin; it's worthwhile to review the whole message. 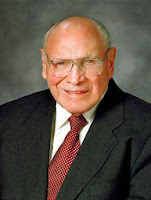 Elder Wirthlin teaches that faithful living does not guarantee freedom from challenges in life; but it does ensure that we don't have to face the challenges alone or unprepared. Instead, we can confront difficulties "with serenity and peace" knowing that all will be well in the Savior's care. Even more, we are promised that "all things shall work together for [our] good" when we live according to the four conditions outlined in the revelation: search diligently, pray always, be believing, walk uprightly. If we seek peace, we must come to Him. Ultimately, there is no other way. With Him, there is nothing to fear, regardless of the challenges that surround us. This is a powerful message! Labels: challenges, peace, safety, Wirthlin Joseph B.